The Tablet of Tajallíyát* was revealed after the Kitáb-i-Aqdas around the year AH 1303 (AD 1885-6) in honour of Ustád 'Alí-Akbar-i-Banná (builder-architect),† a native of Yazd, a believer of staunch faith and devotion and one who at the end laid down his life in the path of His Lord. He was a building contractor of wide repute, well respected in government circles, and he was often engaged in construction work for the Governor of Yazd and other high-ranking officials. * This Tablet has been translated in full into English and published in Tablets of Bahá'u'lláh, pp. 47-54. † In the old days in Persia there were no colleges or universities in which students might graduate in the fields of science, art or technology. Those who were described as 'builder-architects' had learned their trade through practical experience working as apprentices to the great master-builders of the time. ‡ see above, ch. 3.
their safety. They went to Isfahán, stayed a few days in the home of the King of the Martyrs and Beloved of the Martyrs and then Ustád went to Tihrán while Nabíl-i-Akbar remained in Isfahán. Ustád 'Alí-Akbar was so dedicated to the Cause that he could never withhold himself from teaching the Faith. Although he was a stranger in Tihrán, he succeeded in teaching some individuals who were enabled to embrace the Cause. He stayed nine months in the capital before returning to his native city of Yazd. On his return, the enemies of the Faith began agitating the authorities in the hope of taking his life. The clergy again issued his death warrant and handed it to the Governor for execution. But his qualities of service and loving-kindness had endeared him to the authorities and high-ranking officials, who extended their protection to him. However, his life was still in danger, for having failed to put him to death officially, his enemies plotted assiduously to assassinate him. For several years he was the target of many an intrigue, but the Almighty protected him for greater tasks ahead. During this time he succeeded in guiding many souls to the Cause of God. It must be remembered that during the Heroic Age of the Faith all the believers lived and laboured under very dangerous conditions. The male members of the Bahá'í community were in greater danger than the female, because in those days women lived a secluded life and did not as a general rule appear in public. Any man who was a Bahá'í could not be sure when he left his home in the morning that he would be alive to return home in the evening. This was especially true if the individual was an educated person and an active teacher of the Cause. Ustád 'Alí-Akbar certainly was one of these. During the few years that he remained in Yazd many incidents took place which were fraught with danger. Eventually, after consultation with the Afnáns,* it was decided that Ustád 'Alí-Akbar should go to 'Ishqábád. He arrived there in the year AH 1301 (AD 1883-4). * see above, p. 50n. In the absence of spiritual assemblies, Bahá'í teachers, or the Afnáns, or Bahá'ís with deeper knowledge of the Faith took counsel together on the affairs of the community. * For a brief account of his life see vol. 1, pp. 198-201. † Mashriqu'l-Adhkár: literally, 'the Dawning-place of the Mention of God'. Unfortunately the building was damaged as a result of an earthquake in 1963 and had to be demolished. 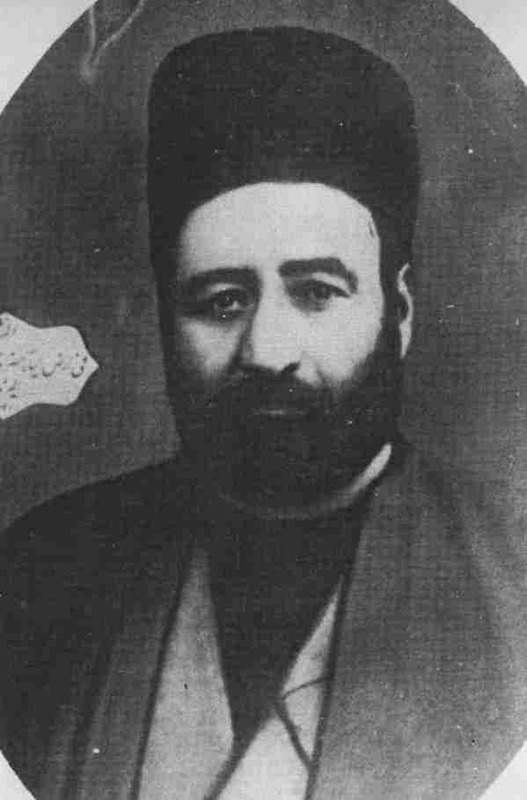 In 'Ishqábád, Hájí Mírzá Muhammad-'Alí, the cousin of the Báb, financed the construction of a two-storey building on the corner of the land which he had purchased from A'zam and which had been set aside by Bahá'u'lláh's direction as a site for the future Mashriqu'l-Adhkár. Ustád 'Alí-Akbar constructed the building, which was dedicated as a Bahá'í centre in the year AH 1305 (AD 1887-8). All Bahá'í activities, such as meetings and receptions, were held in this building until some years later when the House of Worship was built through the dedicated and sacrificial efforts of Hájí Mírzá Muhammad-Taqí, a younger cousin of the Báb. Ustád 'Alí-Akbar took a leading role in the building of the House of Worship. But God had other plans for him. Barely six months had passed from the laying of the foundation stone when he received a Tablet from 'Abdu'l-Bahá urging him to go on a visit to Yazd in the spring. He advised him not to hesitate or delay his departure. Ustád 'Alí-Akbar immediately arranged his affairs and in the spring of 1903, after twenty years of absence, he arrived in his native city. His arrival coincided with a period of unusual activity by the Bahá'ís of Yazd. Some well-known teachers of the Cause were coming and going, and the Bahá'ís were very active in teaching the Faith. The arrival of Ustád 'Alí-Akbar in particular created a stir among the non-Bahá'ís, who circulated rumours that he was about to build a Bahá'í House of Worship in Yazd. The people who lived in his neighbourhood were particularly angry, because over the years he had succeeded in converting many souls to the Faith in that area. their lives in the path of God. This was the summer of 1903, a few months after the arrival of Ustád 'Alí-Akbar. Ibn-i-Abhar left Yazd; he had hardly reached a neighbouring town when suddenly a great uprising against the Bahá'ís erupted in the city, which soon spread to several villages around Yazd. This was the greatest upheaval that had occurred in Persia during the Ministries of Bahá'u'lláh and 'Abdu'l-Bahá since the blood-bath of Tihrán after the attempt on the life of Násiri'd-Din Sháh in 1852. The upheaval within the city of Yazd lasted a few days. Every Bahá'í who could be found was put to death. A great many believers laid down their lives for the Cause of God in most moving circumstances. The History of the Martyrs of Yazd published in Cairo describes in detail the martyrdom of these souls. However, it is a well-known fact that few people have succeeded in reading this book all the way through; its heartrending stories are so piercing that most people stop reading after a few pages. Ustád 'Alí-Akbar was among those martyred. The first fatal shot was fired by one of his close relatives. He fell to the ground and shouted, 'Yá Bahá'u'l Abhá'! Then crowds of people attacked, smashed his head with a pickaxe, tied a rope to his feet and dragged his corpse through the city where hundreds of people hurled stones at it and inflicted blows upon it. His disfigured body was then lowered into a deep unused well on the outskirts of the city in which the bodies of other martyrs had been deposited. Tablets in his honour. 'Abdu'l-Bahá also honoured him with many Tablets. When Ustád 'Alí-Akbar received the Tablet of Tajallíyát he was particularly fascinated by it, as Bahá'u'lláh had sent him pages of 'revelation-writing' along with the text of the Tablet. When Tablets were revealed, Mírzá Áqá Ján, Bahá'u'lláh's amanuensis, usually took them down. But the speed of revelation was so fast that his handwriting, known as revelation-writing, was practically illegible. We have discussed this subject more fully in a previous volume. In the Tablet of Tajallíyát Bahá'u'lláh reveals a glimpse of the transcendent splendour of His Revelation. In a few passages He extols the Mission of its Author in such wise that some may find it difficult to appreciate. It is interesting to note that Bahá'u'lláh often repeats a certain subject in His Writings, but each time it is freshly revealed and expressed in a different way. One subject, however, appears more than any other in the Writings of Bahá'u'lláh: one can hardly come across a Tablet which does not expound the greatness of His Revelation and the exalted station of its Author. * see vol. 1, ch. 3. For a facsimile of a page of the Tablet of Tajallíyát in revelation-writing see vol. 1, facing p. 110.
him of identifying Himself with that Invisible Reality, the Essence of Deity itself. 9. Bahá'u'lláh, quoted by Shoghi Effendi, 'The Dispensation of Bahá'u'lláh', in The World Order of Bahá'u'lláh, p. 104.
in history will not be able to accept Bahá'u'lláh's claims to such an exalted position. In the above passage He confirms that such a claim would strike 'terror into the hearts of the ignorant'. Even some of His followers whose hearts have been touched by His love but who have not had the opportunity to deepen themselves in the verities of His Faith and discover the inner significances of His Revelation may find themselves severely tested when they come across Bahá'u'lláh's utterances revealing some of the awe-inspiring features of His transcendent Revelation. They may be equally tested by the statement of the Báb, Himself a Manifestation of God, saying that He would be 'the first to adore' Bahá'u'lláh. The mind is bewildered when it attempts to contemplate the station of the 'Adorer'--the Báb, a Manifestation of God, the 'Primal Point', the 'King of Messengers', one 'round Whom the realities of the Prophets and Messengers revolve'. The 'Adored One' is Bahá'u'lláh, and it was noted in the above passage that the Báb describes Him as 'the One Who shall proclaim under all conditions, "Verily, verily, I am God, no God is there but Me, the Lord of all created things. In truth all others except Me are My creatures. O, My creatures! Me alone do ye worship."' The Writings of the Báb are replete with passages* such as this one. Bahá'u'lláh Himself in one of His Tablets11 makes a striking statement when He testifies that the Cause is so mighty that whenever His Pen moves to inscribe its greatness, it trembles and swoons away. * For further information see vol. 1, ch. 18.
one and the statement that Bahá'u'lláh is the supreme Manifestation of God. Manifestations of God were able to understand the Essence of Divinity they should be equal to Him, and this is blasphemy. 13. Quoted by Shoghi Effendi, 'The Dispensation of Bahá'u'lláh', in The World Order of Bahá'u'lláh, p. 113. From these and many other Writings of Bahá'u'lláh we arrive at the conclusion that there can be no direct path or relationship between Him Who is the Essence of Divinity and all others, including His Manifestations. There is no door which could lead His creatures to His innermost Reality. We read in the Long Obligatory Prayer that He is far exalted above the reach of man's prayers. We note that God is 'sanctified above all attributes'. In many of His Tablets and prayers Bahá'u'lláh has testified that one cannot attach any attributes to the Essence of God. This can be easily appreciated, for any attribute which may be related to Him will have a limiting effect on Him, and consequently He will cease to be God. Those familiar with mathematics and the term 'infinity' know that it is impossible to evaluate it in terms of a number, however large. It would cease immediately to be 'infinity' if it were identified with any item other than itself. God is the infinite Being. The attributes 'the All-Knowing', the All-wise', 'the Incomparable' and others cannot be related to the Innermost Reality of God, His Essence. for one's mind to visualize God is to turn to His Manifestations. The explanations of 'Abdu'l-Bahá may be summarized by saying that the Infinite cannot be comprehended by man's finite mind. religions, are all the recipients of the Holy Spirit of God. And it is through the aid of the Holy Spirit that at each age they have revealed the attributes of God to Man. * Dungeon in Tihrán where Bahá'u'lláh was imprisoned. † see vol. 3, chapter 7. In past Dispensations God's Revelation had been indirect through the intermediary of the Holy Spirit. In this Dispensation, however, for the first time the Most Great Spirit of God has revealed Itself directly to Bahá'u'lláh and ushered in the Day of God. The most important point which can help clarify any misunderstanding about the station of Bahá'u'lláh is the dissociation of His human temple from the 'Most Great Spirit' which animated it. When we refer to Bahá'u'lláh, we are referring to the 'Glory of God', the 'Most Great Spirit' and not to a human being. When He speaks, the words are not His. They issue from the 'Most Great Spirit' which speaks in the language of man through a mouthpiece--the Person of Bahá'u'lláh. We often come across the words of Bahá'u'lláh saying 'I am God'. In many instances He declares that all creation has come into being through one of His words, or announces that He has sent all the Messengers in the past. The following passage is a typical example. Manifestation of His 'Most Great Spirit' to mankind, His Supreme Manifestation, or the Universal Manifestation Who appeared in His Greatest Name, Bahá (Glory). Although one must distinguish between the Spirit which animated Bahá'u'lláh and His own Person, and be on one's guard not to attribute the glory of His Revelation to His human frame, it is nevertheless clear that the Person of the Manifestation cannot be dismissed altogether. On the contrary, the human temple which becomes the carrier of such a mighty Spirit moves and acts with the majesty and authority of God. The overwhelming and all-pervasive power of God is so infused into every atom of His Being that in every action He portrays the signs and tokens of divine power. Those endowed with spiritual insight can see in every move of the Manifestation of God, the attributes of God unmistakably apparent. His thoughts. His words, His actions are all motivated not by a human soul but by the Divine Spirit. * For further discussion of the term 'Universal Manifestation' see vol. 1, pp. 309-11. * see vol. 1, pp. 64-6 and 118-19. The Revelation of Bahá'u'lláh has endowed the human race with new capacity and bestowed upon it immense potentialities. In the above passage Bahá'u'lláh asserts that through Him has 'appeared that which had been hidden from time immemorial and been veiled from the eyes of men'. As we look back upon the progress of humanity throughout the ages we can clearly see that the advent of every Manifestation of God has coincided with a time when the older Dispensation had come to its end* and was enveloped in darkness. But the Dispensation of Bahá'u'lláh is different in that it has brought to light all that was hidden from man because of his lack of capacity in the past. * see below, pp. 155-6.
clash of differing opinions. Hundreds of sects were created in religions and many left religion altogether and swelled the ranks of agnostics and atheists. Many contrasting political and social systems were created and many controversial philosophies were introduced and established throughout the world. These divisive developments in the fields of religion, politics and social affairs are threatening to plunge the human race into a deep and dangerous abyss. On the other hand, there has occurred such an explosion of arts and sciences in this new era as bids fair to usher in an age in which spiritual and material forces will combine together to bring about a new civilization which will be well-balanced and world-embracing. These manifestations of human activity, with all their constructive as well as destructive consequences, are unprecedented in the annals of the past and owe their origins to the dawning of the Sun of Truth in this new age. The 'Bearer of the Most Great Name', the 'Speaker on Sinai', the 'Hidden Mystery' and the 'Treasured Symbol' mentioned in the above passage all refer to Bahá'u'lláh. One of the basic teachings of Bahá'u'lláh is that man can never know God directly. * see vol. 1, pp. 175-80. † see vol. 1, pp. 185, 299n. ‡ see vol. 1, p. 46. 29. Tablets of Bahá'u'lláh, p. 51.
demonstrated by thousands of its martyrs, its saints and scholars, its teachers and administrators, is indicative of an unshakeable faith and certitude unprecedented in the annals of religion. If it were not for the steadfastness of the followers of the Báb and Bahá'u'lláh in the face of brutal attacks and persecutions, the Bahá'í community could not have won such remarkable victories within so short a period of time. And be thou so steadfast in My love that thy heart shall not waver, even if the swords of the enemies rain blows upon thee and all the heavens and the earth arise against thee. People often wonder how to recite this Tablet with absolute sincerity. It may be said that reading with absolute sincerity takes place when the reader can truly reach to such heights of faith and assurance that 'his heart shall not waver, even if the swords of the enemies rain blows upon him'. In one of His Tablets30 Bahá'u'lláh states that a person will become steadfast in the Cause when he is absolutely assured in his heart that he does not need to turn to any religion other than this Most Great Revelation. * For further information see vol. 2, ch. 5. Bahá'u'lláh and recognizing Him as the Manifestation of God, one ought to continue the search, perchance one may find it elsewhere. To hold such a view is a clear indication that the person has not discovered the truth in the first place and has not reached the stage of assurance in his faith. On the other hand, having found the truth, one never reaches the end of his journey; for as long as one lives there is scope for a better and deeper understanding of the truth he has found. In The Seven Valleys Bahá'u'lláh describes how the wayfarer passes from one stage to another. It begins with the Valley of Search when the individual seeks to find the Truth. When he discovers the object of his search he moves forward to other valleys, the Valleys of Love, of Knowledge and the rest. To remain in the Valley of Search for ever is an evident sign of failure to find the Truth. The recognition of the Manifestation of God must be followed by steadfastness in His Covenant, which means simply obedience* to the Centre of the Cause and carrying out His laws and teachings. When we study human nature we notice there are two forces within man which are always at work in opposition to each other. One is the force of the animal nature which tends to drag him down into the animal kingdom. The other is the force of the spiritual nature which elevates man to great heights of nearness to God. A human being may be likened to an aircraft which is also under the influence of two opposing forces. The first is the force of gravity which tends to pull the machine down toward the earth; the second, the lifting force of the engine which propels the machine upwards. By its nature the former is always present and effortlessly pulls down the craft, while the latter force is applied only when the engine is switched on and kept running. As long as the engine is running, the aircraft can fly. As soon as it stops, the force of gravity will instantly pull the machine down. * For a further discussion of the subject of obedience see vol. 3.
degrade the station of the individual to that of the animal and far beyond. The spiritual nature, if allowed to exert its influence, can subdue the animalistic inclinations and lift man to great heights of spirituality just as the aircraft engine provides the force to lift the aircraft. This upliftment and spiritual growth occurs when the individual recognizes the Manifestation of God and acquires faith and assurance. Although having faith in Bahá'u'lláh will cause the human soul to be uplifted spiritually, it will not be sufficient for the individual to overcome the many tests and trials he encounters in life. There is yet another important step which must be taken after having recognized the station of Bahá'u'lláh and embraced His Faith. To elucidate this point we may use the analogy of the flying machine again, as it can throw further light on this subject. A powerful engine will not necessarily guarantee the safe landing of an aircraft at its destination. It is the navigational instruments continuously receiving signals from a central point, that guide the pilot to navigate the aeroplane throughout its flight. The safety of the plane and its landing at a destination depends upon the pilot who must unquestionably obey the signals he gets from the control centre. A similar situation faces a believer in Bahá'u'lláh. To have recognized Him as a Manifestation of God is not sufficient. What is needed in addition is steadfastness in the Covenant, a term which may be summed up as turning to the Centre of the Cause and obeying His guidance. In the days of Bahá'u'lláh He, Himself, was the Centre of the Cause to whom the believers turned. After Him they turned to 'Abdu'l-Bahá as the Centre of His Covenant, and then to Shoghi Effendi, the Guardian of the Faith, and today to the Universal House of Justice. It is by turning to the Centre of the Cause as an infallible source of guidance that the believer can be protected from many pitfalls in his life and, like the pilot in the analogy who follows the navigational instructions, arrive at his spiritual abode in the worlds beyond. * see below, pp. 162, 236.